Go back Ubersreik and kill more rats. 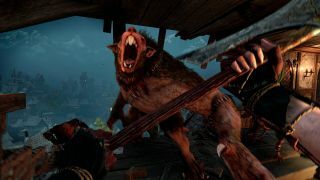 Warhammer: Vermintide 2—Back to Ubersreik crawled out of its warren today, expanding Fatshark’s gruesome first-person rat extermination game with three remastered levels from the first Vermintide, set in titular Ubersreik. Magic, of course, explains why you and your chatty pals are going back to the Skaven-infested city. The grey wizard Olesya sends everyone to an illusion of Ubersreik that’s still full of angry, ravenous rodents waiting to be riddled with holes, burned to a crisp and chopped up into little pieces. Horn of Magnus, Gardens of Morr and Engines of War have all been remastered, and as well as the new maps, there are new quests, challenges, weapons and illusions. This DLC also changes how DLC missions work. Now, in order to host a custom game with DLC or select it in Quickplay, you or another player in your Keep will need to own it. Previously, you could join a DLC mission through Quickplay even if you didn't own it. Back to Ubersreik is £7/$10 on Steam. Here are the patch notes.